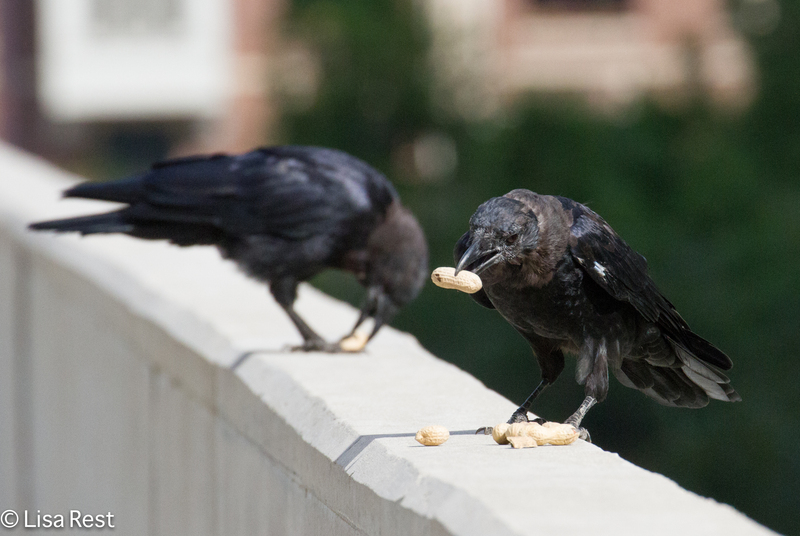 As promised, a little update on the Chicago Loop crows. 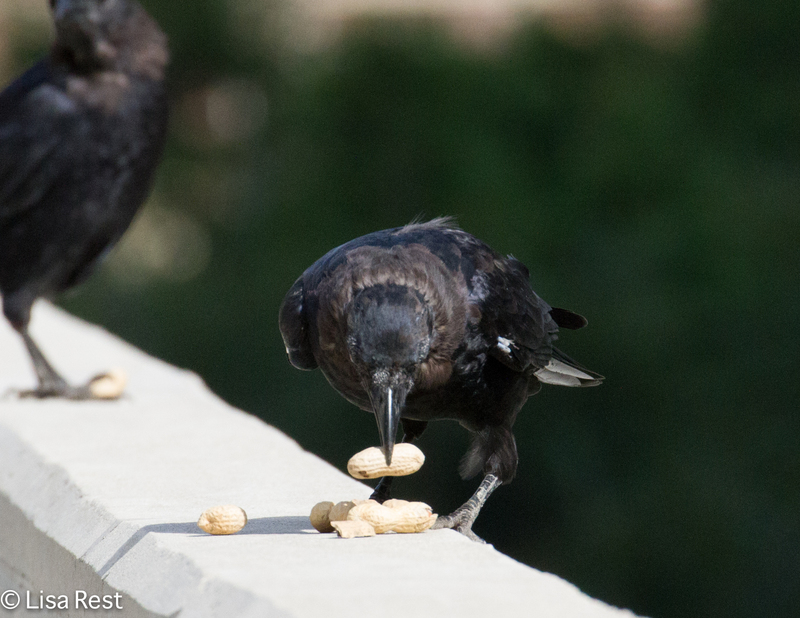 As in previous years I seem to be a trusted source of peanuts and general interest among the juvenile crow population as they head into their first winter. The interesting thing to me, as their human provider, was the fact that they seemed to identify me in their earliest days of independence just a few months ago, and when a couple crows would approach me, I was unaware of having made their acquaintance previously. There were a couple individuals that I knew from their Lake Shore East Park nursery days, but too many others hanging out in other locations were recognizing me. 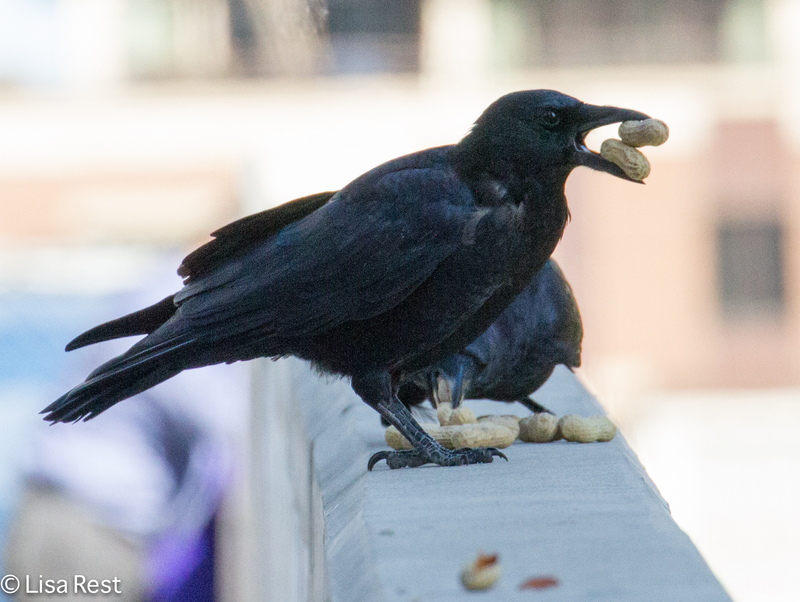 So this confirms my suspicion that I am genetically imprinted on successive generations of American Crows as a Trusted Peanut Provider. 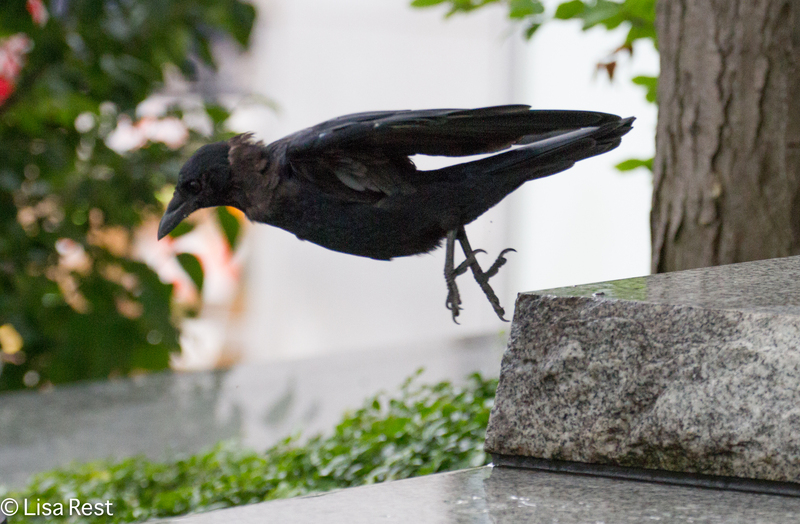 I like to think of myself as an Honorary Crow. We do peanuts in several places but none are as fun as the cement wall that prevents cars and people from dropping down to the lower level where directly at present there is a vacant lot. I hope the lot remains vacant. It has a couple cottonwood trees and weedy patches where I have seen birds on occasion, albeit from a distance. 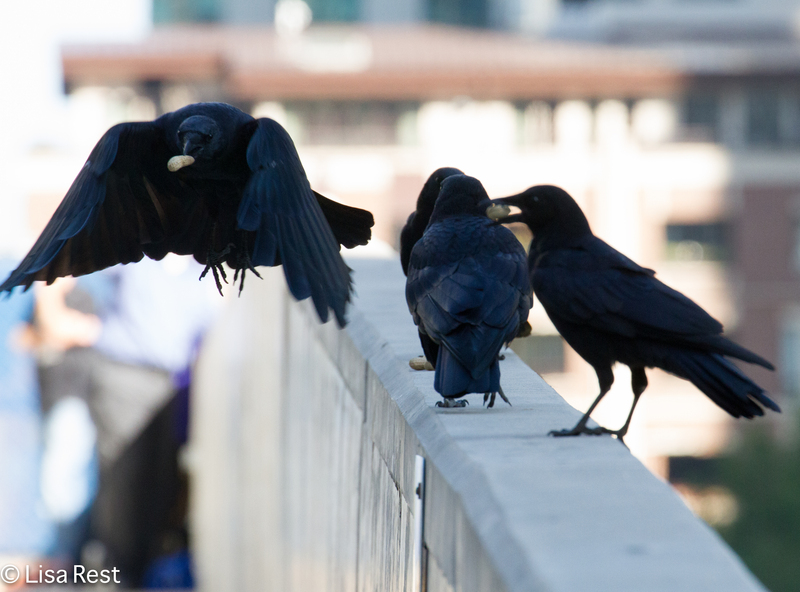 A couple weeks ago I would encounter a few crows at a time, maybe up to four individuals. 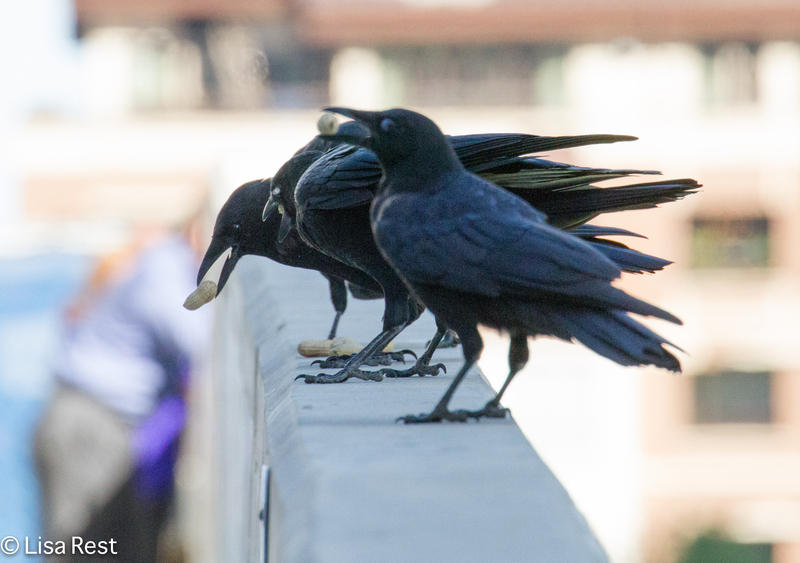 But now I have an army of 15 crows attuned to my whereabouts and they are often vying for peanut rights. I take these to be three or four family groups learning how to get along with each other. Or not. 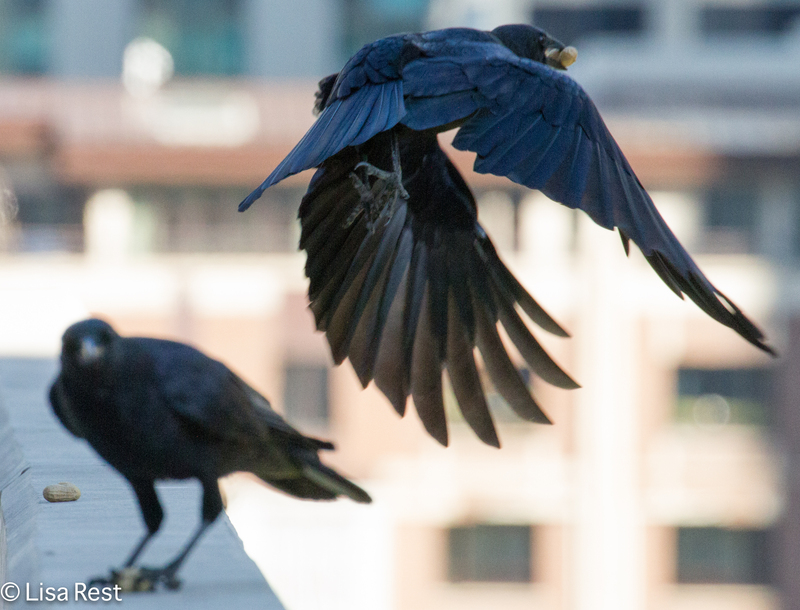 As the weather gets colder and the days shorter, the crows will pretty much have my undivided attention, and that is just how they like it. I like it too, I get to visit with them. In some way they confirm my existence. They know more about me than I do. It will be fun to try out The Birdz Cookies on a new batch of crows. See if that’s genetically imprinted information too. It oughtta be. Please pardon a brief weather update. We have had rain for three days in a row. Today it is tapering off a bit but still too cloudy for the camera. I made use of Monday’s rain by taking time to get a haircut. Tuesday’s rain kept me inside working. Today’s rain? 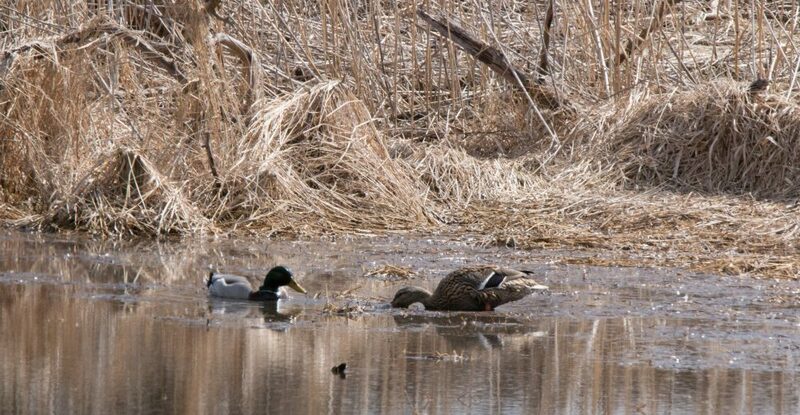 I may go out for a drizzly walk with binoculars only, just to see if there are any birds left. This morning I could not even get a White-Throated Sparrow to respond to my call. Monday morning there was a little Winter Wren at 155 N. Wacker that almost looked like a field mouse. But you’ll have to take my word for it as I have no pictures. Just as well, the light is a challenge now even on sunny days in Lake Shore East Park due to the shadows cast by the surrounding buildings. Might be time soon to check out Maggie Daley Park and see if there is any habitat surrounding the Skating Ribbon. 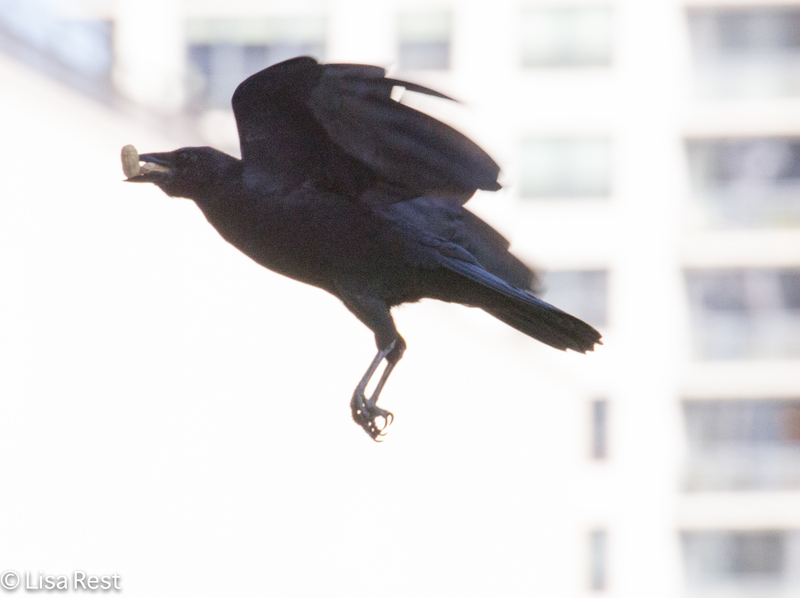 This entry was posted in birds, Crows and tagged Chicago Loop, feeding birds, Lake Shore East Park, peanuts by Lisa Rest. Bookmark the permalink. 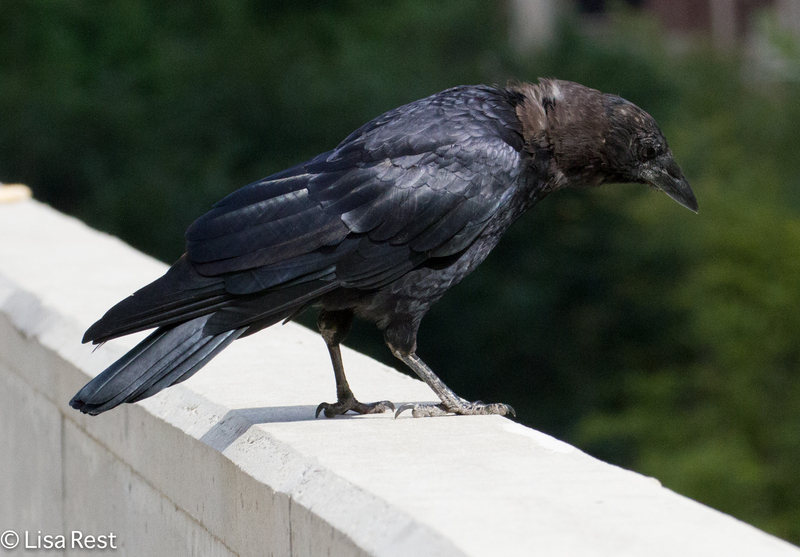 I like the idea of the crows knowing about you, They can recognise a bird lover when they see one obviously. Thank you. 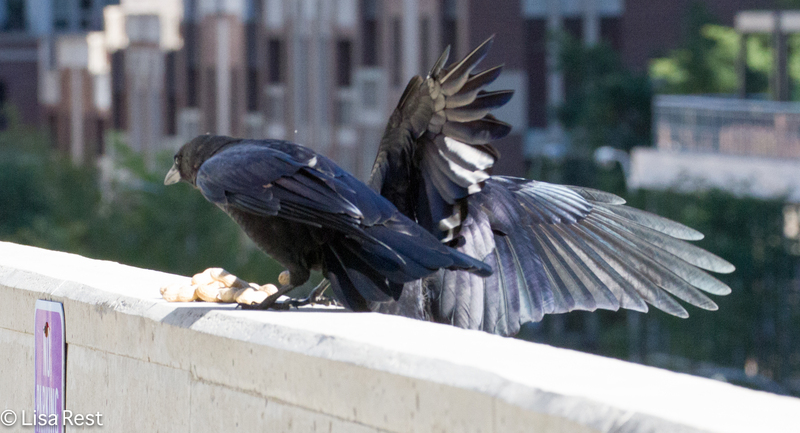 It’s very life-affirming to be recognized by these birds and they’re smart enough to make me think it isn’t just about peanuts. Although I suspect it probably is. But it feels great to be so trusted. It was what my mother used to call ‘cupboard love’ but none the less welcome. I wonder if it will be a dominant gene? If that’s the case give it a couple years and you should be able to bring in a flock of crows wherever you travel!